Bridal necklace made of crystal drops, bicones and silver crystal rhinestone balls.Stunning necklace which can be worn with the matching Gouttes bracelet, earrings, tiara, comb and hair pins. 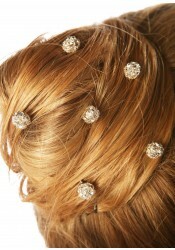 Available in transparent with silver crystal balls (see photo) or gold crystal balls. We ship to Europe, Switzerland and Worldwide. of small size and flat. We are unable to ship to certain countries. Please see our Delivery page to learn more. This product has not received any notice.